The space elevator is means of ground-to-space travel. It consists of a cable attached to the surface of the planet upon which cars physically travel up and down. On its end, beyond geosynchronous orbit, a space station counterbalances the weight and helps to keep the cable vertical above the planet's equator. Science fiction author Arthur C. Clarke is commonly credited for making the concept known to the wider public, in his novel "The Fountains Of Paradise" (1979), although American science fiction writer Charles Sheffield also wrote a novel featuring a space elevator in the same year (The Web Between Two Worlds) and the scientific concept of space tethers in general is attributed to Russian space scientist extraordinaire Konstantin Tsiolkovsky (late 19th-early 20th century). The world's first elevator was built for Mars. Phyllis Boyle supported the project throughout the 2040s before UNOMA. The transnational EC constructed the cable; the East-Asian Commonwealth constructed the elevator cars. An Amor asteroid was used to create the elevator. The construction took 11 years, circa 2047-2058. The cable was 35,000 km long and 10 meters thick, weighing 6 billion tons. The space station Clarke, named after the author, was built on the remainder of the asteroid at the end of the cable. The cable was attached to the Martian surface at Pavonis Mons caldera, which was suitably situated at the equator, and in which the city of Sheffield had grown. The attachment point was the Socket. 400 cars went up and down the cable at 300 km/h; the journey took five days. The elevator greatly improved Mars's exporting capability. Martian minerals were massively exported to Terra and Terran immigrants flooded Mars. The elevator was destroyed during the First Martian Revolution in 2061. Bogdanovists placed and ignited charges at the joining point of the cable with Clarke. Clarke left Martian orbit while the cable violently wrapped itself around the Martian equator, twice. Peter Clayborne was on an elevator car during the attack. 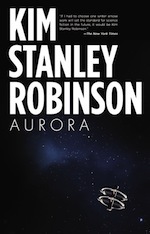 He left the car and drifted in space; he was rescued by chance by a passing spacecraft. Those who were on Clarke, among them Phyllis, got all the Earth-to-Mars freighters out, linked them together, loaded all the supplies on them and left Clarke. They propelled themselves towards the Jovian system. After 10 weeks, they used Jupiter's gravity to swing them around towards Earth (becoming the fastest traveling humans in history in the process) and, with limited supplies, they safely reached Earth and survived. Amor asteroid 2034B was used to construct the cable, using automated robots. The construction began in 2088. The second elevator used the same departing point, the Socket at Sheffield. The station at the end was New Clarke. The elevator was again managed by the Space Elevator Authority. During the Second Martian Revolution, the Kakaze attempted to take it down, which forced UNTA forces to retaliate with firepower. This elevator survived well into the 23rd century. By 2127, Terra had ten elevators. Advances in materials were such that allowed for Y-shaped cables to exist. The elevators could thus depart from cities situated outside of the equator, one North and one South, and join into one cable some 10,000 km above the surface. One forked to Virac (Philippines) and to Oobagooma (Australia); another to Cairo (Egypt) and Durban (Azania). The Martian ambassadors used the one to Port of Spain (Trinidad and Tobago), of which the South branch went to Aripuana (Brazil).